Gothenburg is an innovative port city with an intercultural history. Gothenburg is amazingly easy to get around in and combines cosmopolitan luxury and entertainment with the calm, open beauty and bounty of the Swedish seaside. 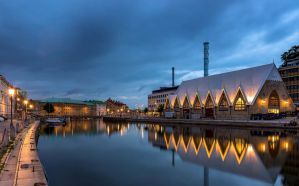 This city has a little something for everyone, whether you're into night-life and partying, amusement parks, great seafood, island-hopping, or exploring the architecture in the local parks, Gothenburg has it all. Because of the great transit system, it's easy to get to all of it too. It's also a very bike-friendly location and is a favorite among travelers from all over. These hostels and hotels provide excellent inexpensive accommodations as a base for exploring the wonders that Gothenburg has to offer. How much do hostels in Gothenburg cost? This hostel is a large building with many room offerings varying from 2-bed rooms to dorms with 16-beds. There is a large, well-furnished kitchen open to everyone as well as communal lounge areas. The hostel is about ten-fifteen minutes from the heart of the city center by public transit but, it is within walking distance of many attractions, pubs and restaurants. it has a twenty-four hour reception area. Linens are included for dorm beds, but must be either rented or packed for more private rooms. Towels are not included but you are able to bring your own or rent one from the facilities. The hostel is clean and has some great features, such as personal plug-ins for each bed and lockable storage boxes for personal items. There is a breakfast offered for an additional fee, as well as a sauna and pool table for a small additional fee. One of the most popular features of this hostel is the optional organized social events that range from pub crawls, walking tours, quiz nights, and movie nights- all free of charge and great ways to meet other backpackers. This hostel is just next door to the Backpackers. The rooms here are more personal as the maximum to a room is five, and there is both a dorm option and a private option. Each room has a TV and hair dryer and there is a communal kitchen for preparing meals. Linens and towels are not included but you can bring your own or rent them from the facility for an additional charge. Breakfast is available for an extra charge. The hostel offers a sauna, pool table, and movies each night. The shared rooms have drawers for bags that can be locked with a lock you provide. Like the Backpackers, the Slottsskogens also has social events that allow you to meet other backpackers and have a good time exploring or enjoying a night in. The hostel is close to top sights like the canal, museums, and gardens. It is in a good location in a nice neighborhood of the city. There are plenty of bars and pubs for enjoying nightlife, but the rooms are well insulated, so noise isn't a problem if you just want some sleep. This B&B/hostel has bedrooms that sleep from two to five people. There are two kitchen areas as well as terraces with grills for grilling and barbecuing. There is a beautiful lake less than a five minute walk away that has a great beach. It is only about a fifteen minute bus ride to the city center and there are frequent buses to get back and forth. Breakfast is available for an extra charge, but in the slower season it is only offered on weekends. Linens and towels are not included, but you can bring your own or rent them for an extra fee. The reception has limited hours, especially during slower winter months, and they suggest to call ahead to set your arrival time, calling ahead is especially necessary if you plan to check in on Sunday. Linneplatsens offers affordable accommodation right in the center of historic Linneplatsens. It is close to many shopping, dining, and entertainment and attraction options. You have a choice here of either a more traditional hotel style room, or a hostel type dormitory. The hotel option costs a little more but includes bed linens, towels, and privacy, while the hostel option is cheaper and offers a better chance at getting to know others, but it does not include bed linens or towels. Towels and bed linen can be hired for an extra fee, or you can also bring your own. Breakfast is offered for an extra charge, or you are free to make your own meals in the fully equipped kitchen. It is very near many forms of public transportation, which will allow you to get wherever you want to go in Gothenburg.